Ultrasound is a therapeutic modality that has been used by physical therapists since the 1940s. Ultrasound is applied using a round-headed wand or probe that is put in direct contact with the patient’s skin. Ultrasound gel is used on all surfaces of the head in order to reduce friction and assist in the transmission of the ultrasonic waves. Therapeutic ultrasound is in the frequency range of about 0.8-3.0 MHz. The waves are generated by a piezoelectric effect caused by the vibration of crystals within the head of the wand/probe. The sound waves that pass through the skin cause a vibration of the local tissues. This vibration or cavitation can cause a deep heating locally though usually no sensation of heat will be felt by the patient. In situations where a heating effect is not desirable, such as a fresh injury with acute inflammation, the ultrasound can be pulsed rather than continuously transmitted. Ultrasound can produce many effects other than just the potential heating effect. It has been shown to cause increases in tissue relaxation, local blood flow, and scar tissue breakdown. The effect of the increase in local blood flow can be used to help reduce local swelling and chronic inflammation, and, according to some studies, promote bone fracture healing. The intensity or power density of the ultrasound can be adjusted depending on the desired effect. A greater power density (measured in watt/cm2 is often used in cases where scar tissue breakdown is the goal. Ultrasound can also be used to achieve phonophoresis. This is a non-invasive way of administering medications to tissues below the skin; this is perfect for patients who are uncomfortable with injections. With this technique, the ultrasonic energy forces the medication through the skin. Cortisone, used to reduce inflammation, is one of the more commonly used substances delivered in this way. A typical ultrasound treatment will take from 3-5 minutes depending on the size of the area being treated. In cases where scar tissue breakdown is the goal, this treatment time can be much longer. During the treatment the head of the ultrasound probe is kept in constant motion. If kept in constant motion, the patient should feel no discomfort at all. If the probe is held in one place for more than just a few seconds, a build up of the sound energy can result which can become uncomfortable. Interestingly, if there is even a very minor break in a bone in the area that is close to the surface, a sharp pain may be felt. This occurs as the sound waves get trapped between the two parts of the break and build up until becoming painful. In this way ultrasound can often be used as a fairly accurate tool for diagnosing minor fractures that may not be obvious on x-ray. 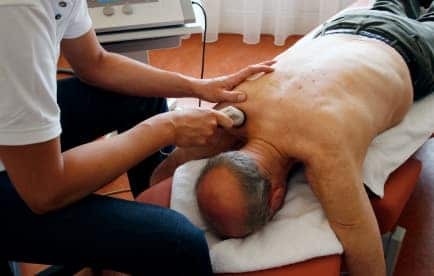 Some conditions treated with ultrasound include tendonitis (or tendinitis if you prefer), non-acute joint swelling, muscle spasm, and even Peyronie’s Disease (to break down the scar tissue). Contraindications of ultrasound include local malignancy, metal implants below the area being treated, local acute infection, vascular abnormalities, and directly on the abdomen of pregnant women. 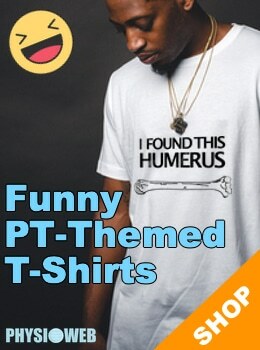 It is also contraindicated to apply ultrasound directly over active epiphyseal regions (growth plates) in children, over the spinal cord in the area of a laminectomy, or over the eyes, skull, or testes.